Telling stories is what Story Starter is all about. 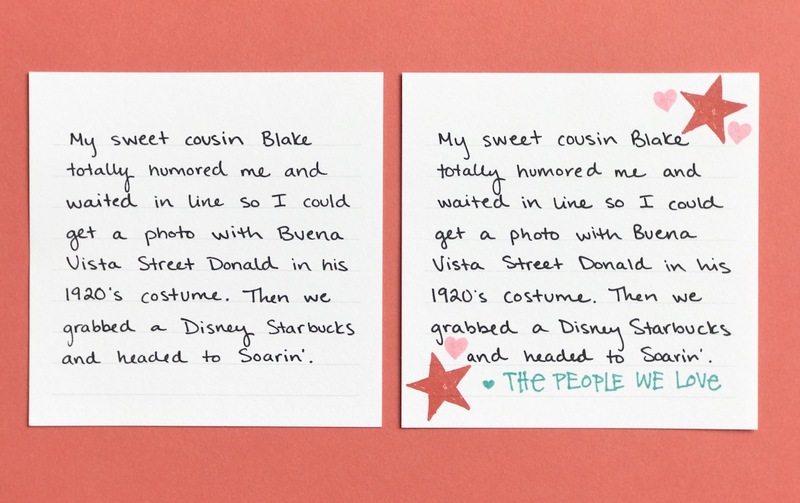 This first workshop kit in the Story by Stacy™ product line walks you through the process of recalling detailed memories, writing them down, and then organizing them into small stories to pair with photos. Story Starter albums get even better when you add stamping to your story cards with the Colorful Textures and Quotable Words stamp sets. These stamp sets are designed especially to work with the stories you tell in these albums, and today we are giving you some ideas for how you can use the Story Starter workshop kit with its coordinating stamp sets to personalize your written memories. There are so many ways you can include splashes of color on your story cards. With the Colorful Textures stamp set, you can stamp simple images to match each story and photo in your Story Starter album. Shapes like hearts and stars fit perfectly next to words on your story card. 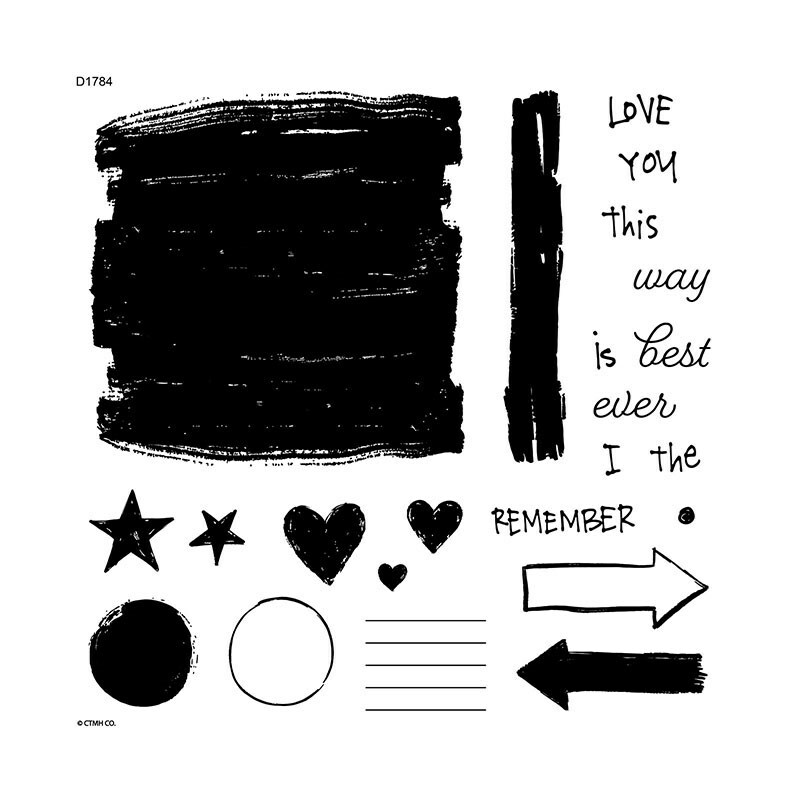 These shapes can also be used to decorate your quote cards. With one solid and one outline circle, small touches of color make your quote cards more interesting and unique to you. Colorful Textures includes a few words that can be used to make short phrases. 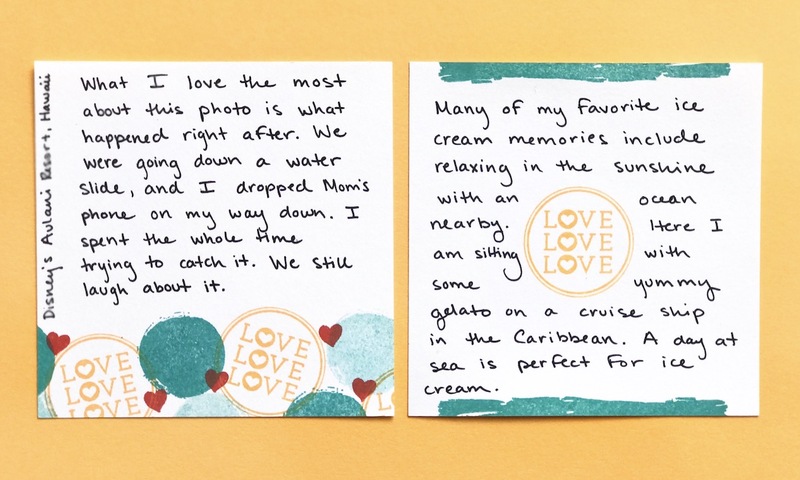 You can see we arranged the words to stamp the phrase “I LOVE the way YOU” on our story card. Build your phrase on a My Acrylix® block, like we did. Leave one word out. Stamp the phrase with Black ink, and then stamp the missing word in a different color. 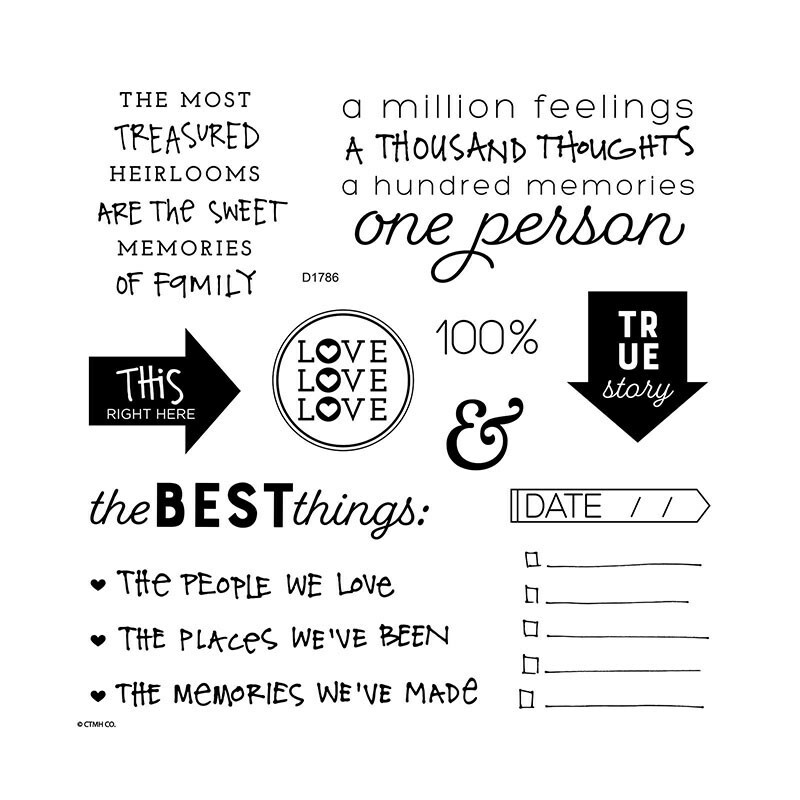 The Quotable Words stamp set gives you many options for stamping phrases or quotes on your story cards. You can use these images to personalize your story, or you can even incorporate them into how you write your memories on the story cards. 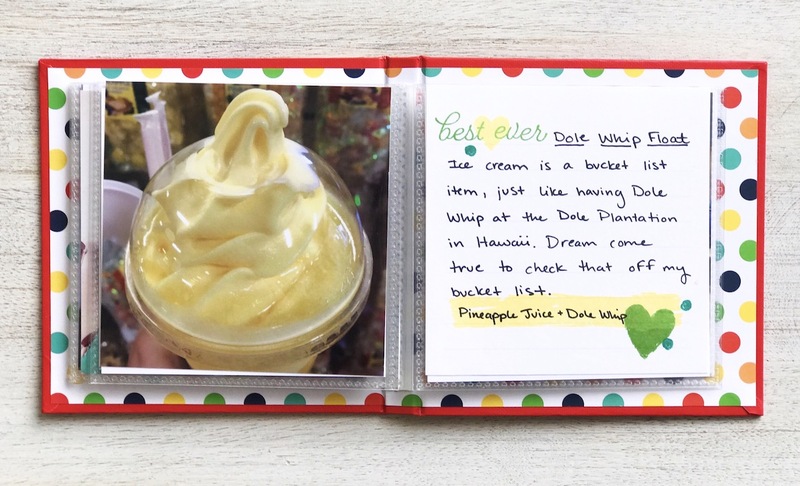 This story card makes use of the checklist image and “the BEST things:” sentiment to create a repeatable format for each story card in the album. Stamp your images in a different color on each story card, like you see here, and then write your memories from your Story Starter workbook in a list on each story card. Not only are these stamp sets designed specifically for Story Starter, they are also meant to work together. You can combine words and textures to create story cards that coordinate with your story and photos. Every card could be different, or you could use a repeatable element on each card. 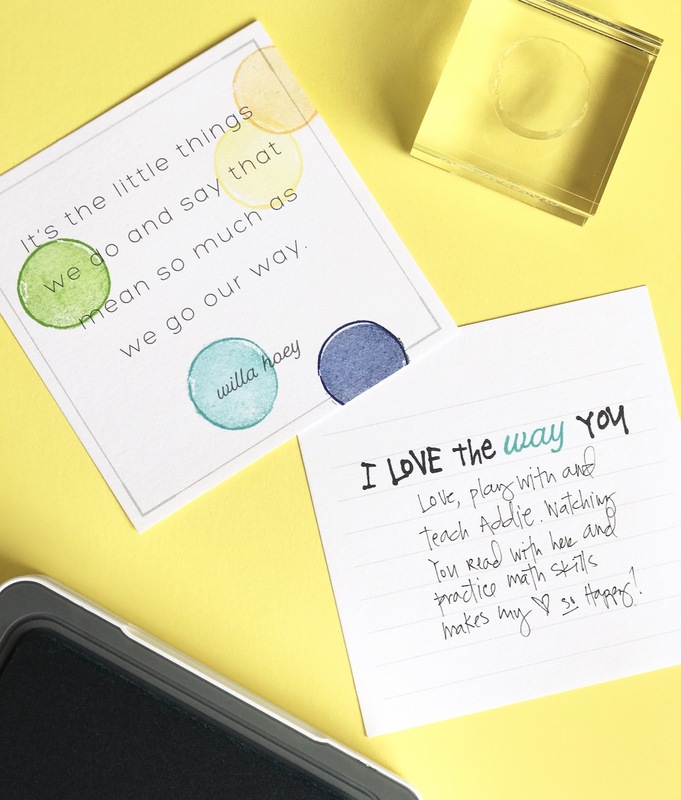 Mix the solid shapes from Colorful Textures with a sentiment from Quotable Words to create borders on your story cards. You can use longer shapes along the edges of your card and stamp a phrase in the middle. As you write your stories, don’t forget you can use the lined or blank side of your story card. The story doesn’t have to fill the entire card. If you have extra space, fill it with a combination of images from Colorful Textures and Quotable Words, or you can intentionally leave some white space as you write your memories down. Stamping on your story cards can happen before or after you complete your writing. In the video, you can see that stamping first lets you organize your memories in creative ways, and it took no time at all! If you choose to write your story first, then stamp with a light color of ink over your words to highlight a particular phrase, or use smaller shapes to stamp around the edges. Your written words and the photos that go with them are the most important part of your Story Starter album. You can see above that the story is complete with or without stamped images. 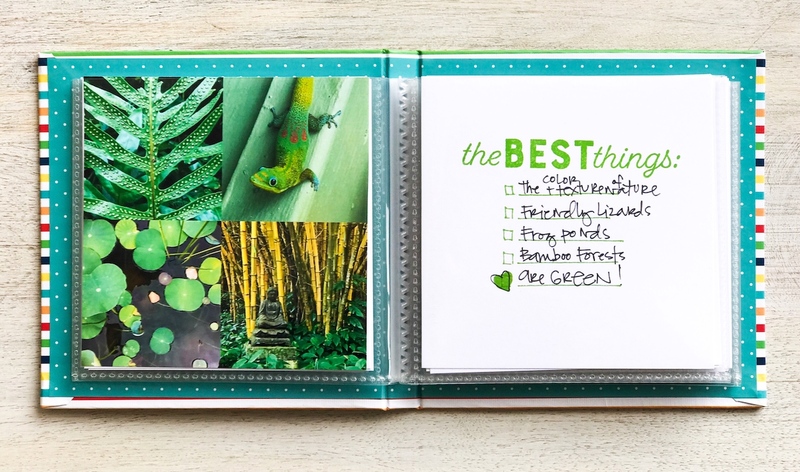 By including stamping, you can make your album your own, add fun pops of color, and highlight the parts that are the most significant to you. Your style is unique, just like your story! Story Starter helps you uncover those stories stuck in your memory bank, write them down, and share them in fun, easy ways. With the Colorful Textures and Quotable Words stamp sets, you use your own creativity to add personalization and color to your Story Starter album. I am a STORY kind of gal… but having just finished the creative part of my first Story Starter I had a be a last and am so excited about making my next one. I love love love the Colourful Textures stamp set (my new fave!) but have now found a new use for so many of my existing stamp sets. Looking at all those words and sentiments in a whole new way. Can’t wait to give it to my youngest as a gift! I love how effective these two stamps are and how quick and easy they are to add decoration to your story.